We see a lot of projects using Eagle for the schematics and PCB layout. There are a few that use Kicad, but we hear very little about other alternatives. Recently, [Limpkin] has been working with Altium and Cadence and wrote about how they compare when it comes to PCB layout. Neither are free packages so it’s good to know what you’re getting into before taking the plunge. [Limpkin] begins his overview by mentioning that the schematic editors are comparable; the differences start to show themselves in the PCB layout tools. Here you can see that Altium always labels the pads so you know what net each of them belongs to. 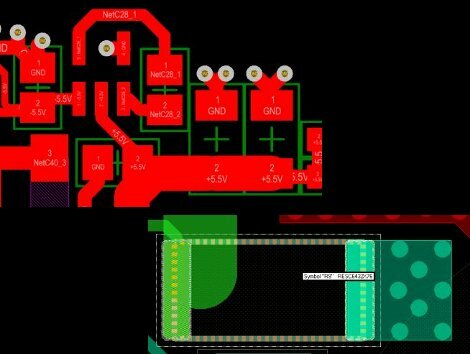 Cadence (whose PCB layout tool is called Allegro) will display the net if you hover over the pad with your mouse. Both have 3D rendering, with Altium’s looking a bit more pleasant but what real use is it anyway? Okay, we will admit we love a good photorealistic board rendering, but we digress. The most interesting differences show themselves once traces are all on the board and need to be rejiggered. Cadence will actually move traces on other layers automatically to avoid collision with a via that is late to the party, and Altium shows some strange behavior when dragging traces. [Limpkin] doesn’t register a final judgement, but the comparison alone is worth the read. [Kurt] was using a bike trainer to get in shape for warmer and dryer biking months. Unfortunately it’s pretty hard to train if you don’t have reliable data concerning how hard you’re working. There’s commercial solutions for trainer computers but he’d read some rough reviews about them and decided to build his own trainer computer. He’s done a great job of integrating a lot of different data collection sources. He picked up two replacement bike computer sensors to use on the back wheel for speed (the front wheel is stationary with this type of trainer) and on the crank for cadence. He also wears a heart rate monitor and sourced a SparkFun heart rate module to gather that data. Finally, an LM235 analog temperature sensor was combined with a spring clamp to detect the temperature of the trainer’s resistance module. Data from the sensors is collected with a PIC16F73 microprocessor and fed to a computer over a serial connection. He’s got a screenshot of the realtime graphs that he’s using for feedback while on the bike. This is a useful and practical setup but when he get’s tired of exercising he’s just a few lines of code from converting this into a gaming controller.